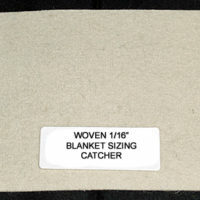 Press Blankets | Product categories | Renaissance Graphic Arts, Inc.
Sizing Catcher: 1/16″ thick, this blanket will absorb the sizing from the paper. It’s a good idea to keep a few of these blankets on hand at all times. 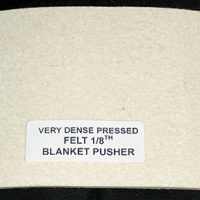 The woven felt will hold up much better than the pressed felt. 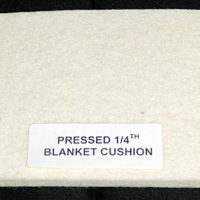 Cushion: 1/4″ thick, 100% wool, this blanket is soft but strong pressed felt. 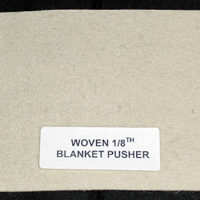 Pusher: 1/8″ thick, this blanket will take the most abuse and become the dirtiest, for this reason this blanket should be the toughest. 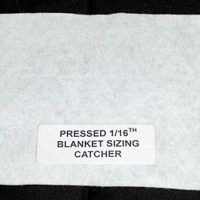 Blankets that become dirty can be washed with any mild detergent but with proper care they should last any printmaker a very long time.